Less than four weeks after its official release, Microsoft's Windows 10 has come close to - but has yet to surpass - the global usage share of Apple's OS X, the only significant rival to Microsoft's family of operating systems, new data shows. According to Irish analytics firm StatCounter, Windows 10's worldwide usage share reached 7.3 per cent on Sunday, a record since its July 29 launch. Also yesterday, OS X climbed to 8.3 per cent. 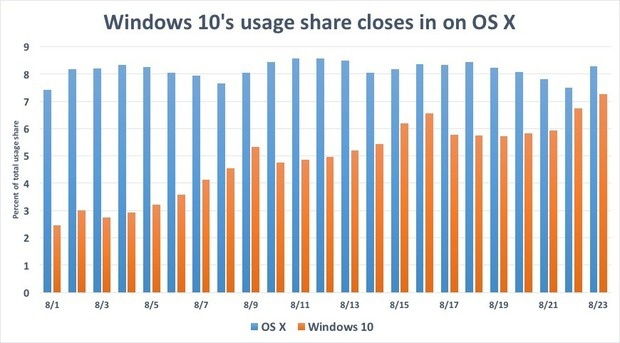 For the week Aug. 17-23, Windows 10's global usage share was 6.1 per cent, an increase over the prior week that was less than half that of the gains posted by the week Aug. 10-16.